Who will be crowned, The KING of Stoke? Get STOKED! 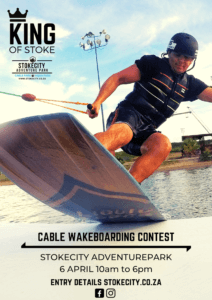 StokeCity Adventure Park will be hosting The KING of the Stoke on the 6th of April 2019. The KING of the Stoke, is brought to you by LiquidForceSA and will feature a wakeboarding and wakeskating contest. The competition will provide riders from all over South Africa the opportunity to compete. The event will feature unisex divisions for all under 19’s and over 19’s. The top female rider in each age category will be crowned the QUEEN of Stoke. We are calling riders of all abilities to REGISTER for the competition before the 22nd of March. There are some fantastic sponsors coming on-board to add to the excitement of the day. Prizes for best trick, and bail of the day will also be awarded. Once you register, we will add you to the mailing list for all event related information. Entry forms are available in the ProShop, or you can download your entry form. We invite spectators to come and support the riders, and spend an action-packed day with us. We will be open for public riding during the day and the AquaPark will also be operational. There will be DJ’s on the decks, with loads of food and beverage options on sale. We will also have some cool brands exhibiting and selling their goods, so prepare to spend the day! Feel free to mail us for more information, and make sure to LIKE the event page for all up-dates! Look forward to seeing everyone on the 6th of April!